Azaz, Syria during the Syrian civil war. 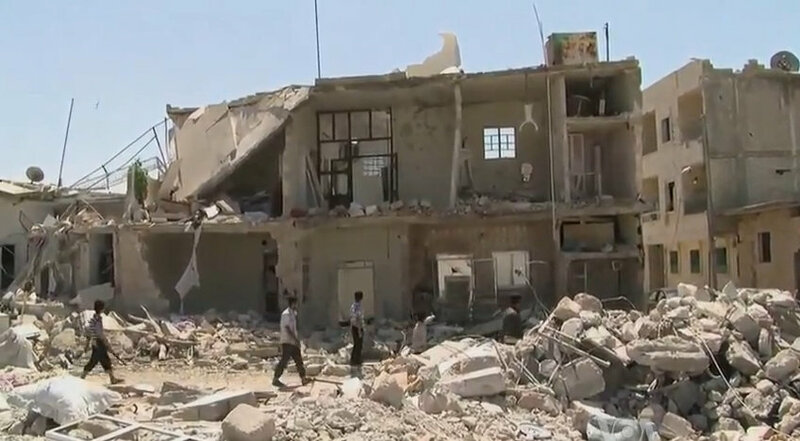 Azaz residents pick up after aerial bombings. 16 August 2012. / Information extracted from IPTC Photo Metadata. On a warm Friday evening in Damascus in early February 2019, the Al Nahlawi family celebrated a daughter’s engagement with a festive dinner with the fiancé’s family. Far away in New York, through a few family selfies and pictures shared on WhatsApp, Ahmad Al Nahlawi, the father of the soon-to-be bride, could almost pretend he was with them. His wrinkly eyes, thick grey hair, and deep laughter, give the impression of a warm friendly soul. He often visits Bal Al Harra, a Syrian restaurant in Bay Ridge whose name is a nod to an Arabic soap opera series that is set in a fictive neighborhood of Damascus. At the restaurant, he jokes around with other Syrians who work and live around the neighborhood, or who drop by the restaurant to grab a bite on the way home. Although he speaks English with the passengers in his cab, he talks in Arabic here, listens to Arabic music in his gray taxi, and has set up his phone in Arabic. Since the beginning of the Syrian Civil War eight years ago, more than 5.6 million people have fled the country, according to the UN, either claiming asylum or living as refugees. Less than one percent of them live in a country outside the Middle East and North Africa region, referred to as MENA. As of January 2017, because of President Trump’s travel ban prohibiting Syrians, and citizens of six other countries from entering the United States, the number of Syrian refugees has dropped considerably. In 2018, the U.S. took in only 41 Syrian refugees, according to the Refugee Processing Center, as opposed to 15,479 in 2016, meaning a decrease of 99.7 percent in two years. “For me,” says Al Nahlawi, “the process was very smooth. I came here with a visa, and I am now waiting for my green card. I have nothing to hide.” Except for himself. Eight years ago, he was visiting a brother in New York when the war exploded in Syria. When he was back in Syria, he used to take part in anti-government protests. “The last time I came here, the war exploded in Syria, and I was demanded by the government back home, so I never came back,” he says. “My friends told me that my name is on the lists at the border. They told me not to come back, because you can’t hide from the Syrian government.” In 2011, back at the start of the civil war, the regime tortured and imprisoned protestors who opposed the government, and took part in pro-Democratic demonstrations. Bachar Al-Assad’s regime was also reported to torture its captives. About 99 percent of 2017’s death by torture happened in government facilities, according to the UN’s 2017 Syria Human Rights Report. “At first I renewed my tourist visa, but I then applied for the Temporary Protective Status, and recently applied for my Green Card.” The protective status is an alternative to seeking asylum. It is designed for citizens who are already in the United States as war and violence erupts in their country, endangering their lives back home. Migrants from designated countries can get a permit to work legally as soon as they submit their applications. Work permits are given to asylum seekers. His wife, three daughters, and one son, are still in Syria. His son and eldest daughter are working in Syria, he said, so he doesn’t need to send money back home. Since he can’t go to them, Al Nahlawi has been working on getting them to come to the United States. But since he left Syria, the procedures to obtain a visa for the United States, worsened. “I have been working on trying to make them come here for six and a half years,” he says. Although the family is willing to leave Syria, they are struggling to make it to the firs step. The U.S embassy in Syria closed in 2012, and the Al Nahlawi family has had to try other U.S embassies across the region. Although the shawarma shop is still operating, the scooter shop now lies in rumble. A video that his son sent him showed that it had been destroyed, and that crumbling buildings replace what once used to be a commercial street. “My son doesn’t even know where the scooter shop used to be,” he says calmly. In December 2018, President Trump’s decision to withdraw troops from Syria left this impression that was slowing down, with a potential victory from Assad’s regime. For Al Nahlawi, the future of the country is uncertain no matter the outcome of the war.